,Conspiracy theorist Trump ally and slippery person Roger Stone headed for the evening news shows following his release on $250,000 bond Friday morning. Stone was arrested by the FBI at a dawn raid at his home in Fort Lauderdale, Florida. Stone was charged by US Special Counsel Robert Mueller on seven counts, including obstruction of an official proceeding, making false statements and witness tampering, according to the special counsel’s office. 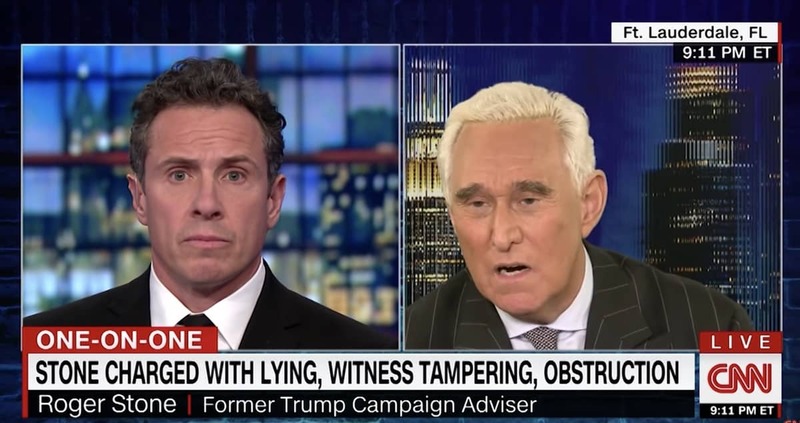 Stone appeared on Chris Cuomo Prime Time on CNN to defend himself. Asked if he would accept one, Stone replied that he doesn’t answer “hypothetical” questions.